Chicken tetrazzini is a wonderful Italian chicken and pasta recipe. It’s one of our easy dinner recipes that works for both everyday dinners or entertaining. You will find lots of tips and variations below. Cook the pasta. When it is cooked, drain it and put it back into the pot it was cooked in. While the pasta water is coming to a boil and the pasta cooks, saute the mushrooms in a skillet over medium heat. Add the peas and cook until the peas are heated through. Toast the almonds by placing them on a baking sheet in a heated oven for just a couple of minutes until they begin to turn brown. Watch closely so they don't burn. Add the mushrooms, peas and almonds to the drained pasta. Add the chopped tomato and sliced chicken. Make a sauce by melting the butter, then adding the flour. Cook for 2 minutes, stirring constantly, then add the chicken broth. Cook for 5 minutes. Remove the sauce from the heat and add the whipping cream and wine plus half of the Parmesan cheese. Add the sauce to the chicken and pasta. Place the pasta mixture in a greased baking dish. Sprinkle the top with grated parmesan cheese. Bake until the cheese is lightly browned, probably about 10 minutes. You can just as easily make this chicken tetrazzini recipe from fresh raw chicken or turkey. Simply saute the chicken before you fry the mushrooms and peas. Season to taste while you cook the meat. You can use whole milk instead of cream if you prefer. It will cut the fat content significantly but still taste good. It may need more cooking time to thicken. Don’t like peas? Simply leave them out or substitute cooked green beans for the same color. The wine adds a lovely flavor to this recipe, but you can easily leave it out if you want. Add the same amount of broth if you need the liquid. Change the meat to an equal amount of cooked turkey for an easy turkey tetrazzini recipe. While we think of chicken or turkey tetrazzini as an Italian recipe it actually originated in the United States. This wonderful pasta dish is named after Italian opera star, Luisa Tetrazzini and is said to have originated either in the San Fransisco Bay area of California or in New York City. Wherever it came from it is one of the nicest Italian chicken recipes you will find. 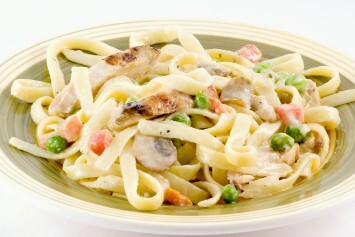 Chicken tetrazzini is just one of our wonderful recipes with the flavors of the Mediterranean. Find all of our Italian recipes here.